Amanda Muhammad, MA, DMCT is a Mindfulness Based Stress Management Consultant in Dallas, TX. She is currently pursuing her Ph.D. in Business Psychology, holds a Masters in Organizational Leadership, and a Bachelor’s Degree in Management and Leadership. After several years of experience in corporate America and education, she found love in teaching others and helping them maximize their potential. Amanda now spends her days teaching accessible ways to take a preventative approach to stress management. We’re excited that Amanda will be presenting at our Working Well conference on Friday, April 12th! Don’t miss out on the opportunity to meet this amazing woman and learn practical tools to stay grounded and centered! Register today. Have you ever been stuck in traffic and while you’re sitting comfortably listening to your podcast, another person is blaring on their horn, and a third driver sits in a pool of anxiety because they’re going to be late? How is it that we can take the same exact situation and react in such different ways? We have a tendency to think it’s the adverse event that causes us to react sub-optimally, however, today I’d like to introduce an alternative reason we respond differently – our perspective. As a Stress Management Consultant, something I often have my clients do is look at their stressors and take an inventory of how many of their common stressors are internal vs. external. 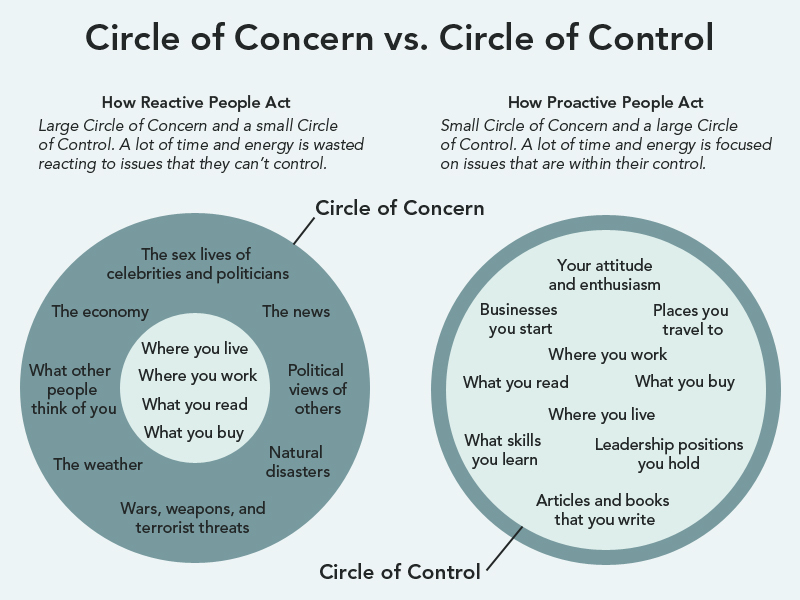 What they will typically find is that the majority of their stressors are actually outside of their control. Ironically, those stressors tend to be the things in our lives that are controlling us. Psychologist Albert Ellis came up with a model for stress called the ABC’s. He says that each adversity we face has three components: the “A” or Activating event, the “B” or your belief about the event”, and “C” which is the consequence that results. The model looks like a math equation, “A+B=C”. What we discover is that the “A” tends to be uncontrollable, so if we want to change the “C” we have to examine the “B”. Your friend turns you down for dinner (A). Now, you believe no one likes you (B). As a result you feel sad, rejected, and alone (C ). We have a tendency to unrealistically distort our experiences which can lead us down a rabbit hole of negative emotions like in that example. If we want to change our emotions, we have to change our beliefs. To change our beliefs, we must examine them. When you find yourself in a pickle like this, I want to challenge you to practice shifting your perspective by asking yourself questions like – Why do I think no one likes me? Does one person turning me down actually mean that no one likes me? Does this one event mean that no one will ever like me? Does everyone have to like me? When we challenge our thoughts and beliefs about ourselves, our situations, and others, we open the door to new perspectives and greater resiliency. Check out this video I made about the ABC’s and how you can actively use this tool anytime! Kay Glidden and her colleague, Beth Reynolds Lewis, have trained over 3,000 professionals in the fields of healthcare, education, law enforcement and more. They have worked extensively in classrooms – with teachers, providing education on compassion fatigue, burnout and vicarious trauma; and with students, teaching mindfulness and emotional regulation techniques. They are also the newest additions to our TEND team of associates! In this blog post, Kay shares about their experiences working with teachers and the importance of viewing the classroom through a trauma-informed lens. Fortunately, this particular principal understood trauma-informed care. When the student arrived at her door, she asked what he needed to do to feel safe. He told her: “I need to build a fort.” So, she helped him build a fort in her office and sat down with him to share crackers and to talk. Once he was calm, he was able to return to the classroom, ready to learn. She understood that he wasn’t a “bad” kid who needed to be disciplined. He was a student with emotional trauma who needed help getting regulated. The National Child Traumatic Stress Network has found that 1 out of 4 children attending school have been exposed to a traumatic event. Teachers go to college to learn how to teach math, science, and reading – not mental health therapy. Thus, they are not often prepared to teach children who have emotional trauma.Teachers can also become quickly overwhelmed if they do not understand the impact of trauma on their students. Viewing the classroom through a trauma-informed lens can give clues as to why some students are triggered during fire drills or by a loud noise; why some students can’t sit still or stare out the window; or why some students are even triggered by going home during a school break. Teachers report that they are seeing more and more children with Adverse Childhood Experiences (ACE’s) in their classroom. Many students with trauma have also been misdiagnosed with ADHD. Giving teachers effective classroom management strategies to employ at the beginning of the school year can help to keep the classrooms under control. Strategies might include arranging the classroom in such a way to promote emotional regulation (considering noises and lighting) or using movement and mantras. Teaching students mindfulness skills can provide them with a toolbox for self-regulation including breathing techniques, meditation, mindful walking and eating. Beth Reynolds Lewis (left) and Kay Glidden (right) teaching mindfulness in an elementary classroom setting. Images shared with permission. Teachers look a lot different in August (fresh and perky) than they do in April (total exhaustion). Many teachers are overwhelmed and many are, unfortunately, leaving the education field. Like many caregivers, teachers tend to help everyone else before themselves. At school, teachers hit-the-door running and are responding all day long. At home, they are parenting and grading papers. How can they find the time to practice any kind of self-care? In some classrooms, teachers may also be exposed to daily doses of traumatic stories from students and their families. One teacher told us that she had a high number of refugee students in her classroom. She was shocked to hear about the trauma they had endured. She often worried about her students, both at school and at home, and it had taken a toll on her emotional and physical health. Educators need to learn the difference between compassion fatigue, secondary trauma and burnout. This way they can understand their symptoms and then create a strategy to maintain their health and build resiliency throughout the school year. During a tornado drill at a middle school, one student often cried and got into a fetal position under her desk. This student absolutely refused to go into the hallway for the drill. The teacher got frustrated with what she perceived as “drama” – but after talking individually with the student, she learned that the student’s home had been severely damaged in a tornado. The tornado drill was actually triggering a past traumatic event. A difficult behaviour that appeared to be drama was actually the result of trauma. As “disciplinary approaches”, students with trauma are often sent out of the classroom to a solitary room, recess is taken away, or behavior charts are used. These are not effective strategies. A better alternative may be providing a “calming corner” or “peace chair” in the classroom where students can go to get regulated or to do breathing exercises. Unfortunately, some teachers tell us that they do not have time for this “fluffy” approach of coddling students. However, we know that if teachers learn to apply these effective strategies for all students, they will have more time to teach – in a calmer and less stressed-out classroom. When teachers see students through a trauma-informed lens, the question isn’t “What’s wrong with them?” – but rather “What’s happened to them?” This perspective, combined with a positive relationship with the student, makes all the difference. Interested in training? Contact us! This protocol applies when there has been no physical injury and the person is stable enough in the aftermath to proceed. In the event that the individual has been physically injured or is in shock you would need to follow emergency procedures and get the appropriate immediate medical resources. This protocol is designed to provide helpful first aid immediately after a team member experiences a particularly distressing or disturbing incident and is undergoing a completely normal stress reaction. This is something either supervisors or peers can offer each other and you will consider what would work best for you in your particular circumstances. Remember that when we are experiencing a high stress response our body is in the flight, fight or freeze state and we are flooding with stress hormones and all the physical, emotional and cognitive responses that go with that. So, our first response introduces safety and containment for the person. Go to the individual, ensure that they are physically out of danger, and ask them to come walk with you. Walk away from the area where the incident occurred and toward a neutral or safe area (if you can get outside that can be even more grounding). Walk beside them and set a pace that is brisk enough to engage the individual and help them discharge some of the distress… as the walk proceeds you may find that they naturally slow the pace – let them progressively have more control over the pace as the debriefing proceeds. Let them know that they are safe now and you are here to support them as they move through this absolutely normal response to high stress. Ask them to tell you what happened in their own words, if they seem stuck in the incident, prompt them to move on with the narrative by asking “and then what happened”. You want to help them move through the whole narrative from beginning to the end – until they get to the present where they are walking with you in safety and are no longer at risk. After you have gone through this initial debrief you may work in an environment where you are required to complete an incident report. If this is the case, go with the individual and ask them how you can help in completing the report. They may want you to type in the information as they dictate it, or they may simply appreciate your presence while they complete the report. Remember to remind them to focus on their breathing and open posture to help them deescalate from the stress response – especially after you have stopped walking and may be standing or sitting. After the initial debrief and report (if required), ask the person what they would find helpful now? Do they want to phone a family member, get a sandwich, take a break, go back to work? They need to have control over their choices while attending to their needs. 􏰃 The debriefer stays with the affected person, and asks a colleague to notify the supervisor about the incident. The debriefer can provide updates to the supervisor as needed. 􏰃 The supervisor speaks with the affected person(s) and assesses whether the person should remain at work following the incident. The debriefer or supervisor assists with making travel arrangements if the affected person is not in a condition to drive home. If the affected person goes home early, the supervisor phones the affected person to ensure that they arrived home safely. 􏰃 The debriefer emails a summary of the incident to the supervisor, based on the information gathered from the affected person. The supervisor may also be responsible for submitting paperwork. 􏰃 The supervisor updates other staff in the office about the incident, as needed. decisions in relation to the incident. 􏰃 The supervisor will check-in periodically with the affected person and continue to offer support in the weeks that follow. Michael V. Genovese, M.D., J.D., is the chief medical officer of Acadia Healthcare which operates a network of 585 behavioral health facilities with approximately 17,900 beds in 40 States, the United Kingdom and Puerto Rico. As well, he is the Medical Director of the Officer Safety and Wellness Committee of the FBI National Academy Associates. Dr. Genovese is also an advocate for attorneys and first responders seeking treatment for addiction and co-occurring disorders. Dr. Genovese writes, speaks, teaches and consults widely in the disciplines of pharmacology, neuromodulation and pharmacogenomics. He has kindly agreed to allow us to share his article on the impact of trauma on first responders. Bravery is one act, but courage is consistent. And our nation’s first responders are the very definition of courage. Each day, they make the difficult choice to run towards the danger that we run from. In doing so, these officers experience significant trauma, yet rarely have the opportunity to process those experiences before speeding off to the next emergency. Science shows that repeated trauma alters the neural pathways and injures the brain. These Post-Traumatic Stress Injuries are linked to startling, yet often unreported, rates of mental health illness, which can manifest into substance abuse or worse. In fact, first responders are more likely to die by suicide than in the line of duty. So why are our heroes not receiving the help they need? In my role as medical director of the Officer Safety and Wellness Committee of the FBI National Academy Associates, I’ve met countless officers who have struggled to overcome the trauma experienced in their line of work. Many say they’re expected to be mentally and physically tough, and the stigma around mental health treatment prevails. Admitting they have a problem may cost them their badge – and their identity. Post-traumatic stress is an injury, not a weakness. If a first responder broke his or her leg in the line of duty, treatment would be a no-brainer. We must recognize and treat brain injuries in the same way. It is not enough to wait until officers are injured. We need to proactively provide training to help officers build resiliency. Resiliency can be learned and can help officers manage the extreme pressure and trauma inherent in the job. Law enforcement agencies must normalize mental health care by proactively offering support services and treatment. This requires a shift in culture which must be led from the top. Support systems can include employee assistance programs, peer support policies and confidential resources, to name just a few. I am proud to be a part of Treatment Placement Specialists, which provides treatment guidance that reflects the individualized needs of officers. Substance Abuse and Mental Health Services Administration (SAMHSA) also provides excellent resources for mental health treatment. In most professions, overcoming personal challenges, such as depression or substance abuse, is supported and celebrated. But for first responders, the result is often the loss of their job. This severe punishment is unnecessary and leads to further trauma and depression. We need to formalize a pathway back to service, so individuals aren’t penalized for seeking help. These are not just academic suggestions. These are practical measures that progressive departments are already taking – and they are working. From whom much is required, much should be given. We must support those who serve by acknowledging the trauma they experience and providing treatment to address the very real impacts on their health. Will you join me? Genovese, M. (2018, October). How Trauma Causes Alternate Pathways in the Brain. Rebuilding Officer Resiliency: A Treatment Guide, 4-6. Heyman, M., Dill, J., & Douglas, R. (2018). Mental Health and Suicide of First Responders [White Paper]. Dr. Deb Thompson is a registered psychologist, certified Integral Master Coach™ and longtime colleague of Françoise’s. They met over 23 years ago while working as clinicians at a University Student Counselling Service and subsequently shared a private practice office for many years. In this guest blog post, Dr. Thompson share’s tips gained from her many years working with clients in the field of body wellness. You can find out more about Deb on her website or follow her on Facebook. As a psychologist/coach and course facilitator specializing in weight wellness, I’ve noticed time and time again how over-eating in the evening is such a common and maddening challenge. I also know this terrain personally, as someone who struggled mightily with food, self-care and weight from my teens to late 30’s. Are you frustrated by the wheels falling off your wellness bus after work and/or at night despite nourishing yourself fairly well during the day? Our Inner Critics can attribute this to weakness, but I encourage your Inner Mentor to get more grounded in knowing that our evening over-eating arises from the perfect storm of being hungry, depleted and/or churning with emotions. 1. Don’t arrive home ravenous! Plan and pack or buy a snack for late afternoon because high, high hunger is high, high risk! When our blood sugar is dropping and our bellies are growling, our primal brains direct us to mow down, which can make for chunks of cheddar or handfuls of trail mix that not only derail our dinners, but also our wellness over the long run. Snacks with some protein, such as whole grain crackers with hummus, a hard-boiled egg or cheese string, almonds with an apple, Greek yogurt or a decaf latte, will stick to your ribs and see you through your commute and transition to home. Higher fiber foods like apples or popcorn can be filling too. See if eating in a planful way during the late afternoon helps you eat less in the evenings, and thereby, helps you to eat less overall. It almost always does! Alternatively, prepare a snack to be ready for you when you get home — a kindly gift from earlier-more-energetic-you to later-whipped-you! If you have kids, this can also help you get through what I used to call the “Arsenic Hour” when everyone is hangry. Cut up veggies or fruits with different healthy dips are handy, as well as helpful for getting in our seven or more recommended daily servings of produce. Aside from a planned snack, don’t mindlessly head to the kitchen as soon as you get in the door or you are off duty for the night. Go to a different room, do something different — even a few minutes of belly breathing, getting into comfies, or washing your face can break the auto-pilot pattern of cruising the cupboards or fridge. As Viktor Frankl said, “Between stimulus and response, there is a space. In that space is our power to choose our response. In our response lies our growth and our freedom.” — creating the gap is key! You may have to train other people to leave you alone for a few minutes, especially if those people are wee ones, but it can be done. You can also create a non-food ritual for exhaling at the end of your second shift… once you are off duty for the evening (more on this in Tip #8). A little meal planning and preparation can go a long way to ensure faster and easier healthy suppers on busy work nights… you don’t have to be Martha Stewart, but having veggies ready to stir fry or roast, planned-overs to warm up, a soup or stew or chili in the slow cooker, or a sheet pan dinner ready to assemble in minutes are all golden. Again, re-frame this as an empathic gift from the person that you are on Sunday afternoons to the person you sometimes become by Tuesday 7pm when you are more depleted, hungry and feeling worn out. Try to keep perfectionism out of the equation to avoid tipping into all-or-nothing thinking or what has been called the “what the hell” phenomenon where we overeat to deal with our emotional frustrations and feelings of self-blame. Having a sticky note reminder of some quicker-than-take out and healthier-than-cheese-and-crackers options, like scrambled eggs or ready-made soup, is also helpful. The emotional residue of our days often rumbles through us into the evening, and it is so very tempting to soothe, numb and reward with food (and wine!). One strategy is to use free writing to honour and process thoughts and feelings — set a timer for 7 minutes and write without pausing the pen (or editing — this is a *dump* — not journaling or essay writing!) to help process your day…let it rip, say *anything*… vent, rant, complain, yearn. When the timer goes, aim to have your Inner Mentor extend kindness and empathy to yourself, as well as see if there are any *Actions* or *Don’t forget* items that need put on your To Do list. Then shred or burn the papers over the sink, wash up and exhale. Getting support, such as through coaching, counselling and the excellent courses here at TEND also helps with reducing the burnout, compassion fatigue and vicarious trauma that can leave us overly vulnerable to turning to food as a (lousy) “friend”. Indeed, everyone benefits from support to build nourished lives such that we have less depletion and stress to prompt us to over-eat after work or at night. This can include creating more belonging, boundaries, a less taxing workload, play/fun/hobbies, rest and sleep, regular enjoyable exercise, emotional supports, and especially: alignment between our core values and our actual lives. Building a nourished life takes time, and guidance/supports, but it’s important that we put some energy into the prevention of being spread thin, not just coping with it. What’s ONE thing you might do this week to move the needle a tiny bit on behalf of more movement, rest, play, or connection? You could get to bed 20 minutes earlier, you could do a 15 minute yoga video in your living room, you could plan a coffee date with an old friend, you could sign up for art lessons, you could explore options for coaching or counselling. Ok, back to more directly disrupting the habit of eating at the end-of-day when you are finally off duty… it’s helpful to develop a menu of alternatives to snacking or imbibing. Perhaps a bath, a good book, magazine, podcast or show on Netflix? Colouring, crafts, games or texting? A warm drink? Some puttering or light tidying up or getting things ready? Or if this last one feels like more work (which may prompt eating as an escape or reward), then leaving those tasks for morning? Looking over your menu can help you choose what will soothe, restore and calm you tonight. For end of day, you may like to plan for a yummy-to-you low calorie treat (eating at night is not necessarily problematic unless it involves EXTRA calories)… winter seems like a wonderful time for a baked apple (here’s a microwave recipe). It’s helpful to keep high temptation treats like chocolate, chips, ice cream, cookies, etc. either out of the house, or at least out of sight and hard to access… as we do tend to eat more in response to availability. Forbidding these foods is not necessary (and often really backfires into all-or-none yo-yo-ing), but often having single serving options, planned treats when eating out, and healthier alternatives such as popcorn instead of Doritos; broth, decaf or herbal tea instead of wine; or Fudgsicles instead of Hagen Daz are very supportive. If part of your evening over-eating is related to feeling beleaguered and exhausted regarding the division of labour in your home, it can be helpful to have a series of conversations about who does what when with your partner/family. Teaching kids to pitch in can be an investment that pays off in the long run. If you live alone, get creative in how you might outsource some work such as cleaning or getting more ready-made foods from the grocery store, and/or have chore or cooking parties with other single friends. Finally, most of us can also lessen our weariness (and vulnerability to emotional or “Eff It” eating) by softening our standards, letting go of impeccability and embracing imperfection with more compassion. September 4, 2018 / By Communications Coordinator / In Uncategorised / Enter your password to view comments. Would you like to learn more information about this program? Click here to arrange to speak with A TEND client care specialist.